Cadillac - Black and white 2 3/4" x 8" ad that has a drawing of the Cadillac Runabout and of the Cadillac with detachable tonneau. The ad headline calls this car "The Automobile that Solves the Problem" and the ad gives prices of $750 for the basic car and $100 extra for the tonneau attachment. Cadillac Model F Touring Car - Black and white 6 1/2" x 10" ad that has a drawing of this classic car. The ad includes information and prices for the Model F, Model B, Model E and Model D. The ad headline lets you know that the text will explain "How Dollars are Saved with a Cadillac." Cadillac Thirty - Black and white 6" x 9 3/4" ad for this car that set the standard. The ad has a drawing of a Demi-Tonneau and mentions a price of $1700 F.O.B. Detroit. After the price are a list of items that are included as standard equipment. The ad headline warns that "Not a dealer in the country can get as many Cadillacs as he could sell." 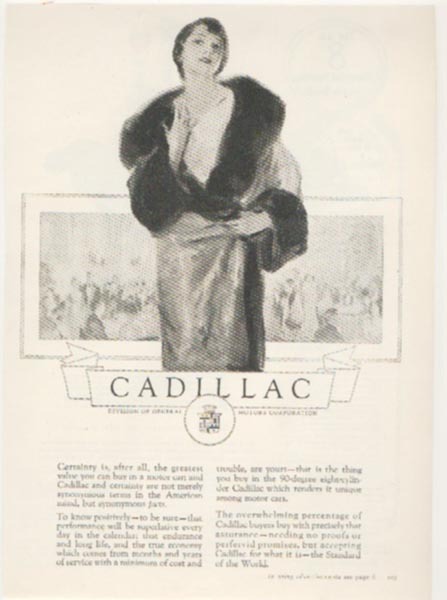 Cadillac - Black and white 8" x 11" ad that shows a well-dressed woman of the times. 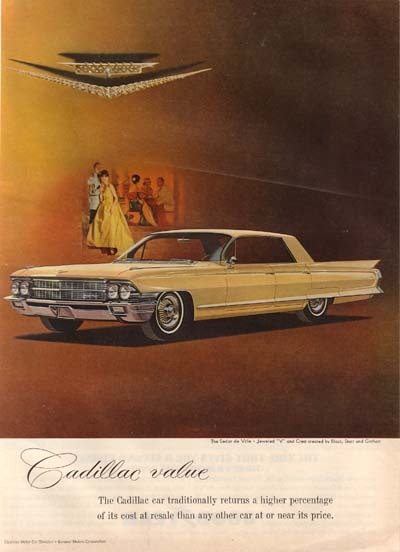 The text of the ad encourages the reader to buy a Cadillac for the value. Cadillac - Full color 9 1/2" x 13 1/2" ad for the car that is "Finer in styling, Finer in comfort and substantially lower in price". There is a picture of a Red Cadillac parked in a dark area with its front end just pulled into the spotlight as the caption introduces The 1935 Cadillac. The text claims that the 1935 Cadillac is "the finest series of motor cars ever to bear the distinguished Cadillac crest" and the company is "happy to offer them at prices which are well below the figures of 1934". It encourages you to come in and try one for yourself and states that "The Motor Car mode is Established by Cadillac". Cadillac-Fleetwood - Full color 9" x 13 1/2" ad with a headline claiming that "Cadillac Shows the World...that supreme luxury can be had at moderate price". There is an enticing drawing of a Blue Cadillac Fleetwood Series 75 five-passenger formal Sedan stopped on a snowy road in the middle of a metropolitan scene where a doorman is going to open the door for an elderly man who has stopped to purchase a newspaper from a young paperboy. The caption gives the price for this model as $3685 with other prices starting at $2595. We are told that there were thirteen Bodies available with "Individual custom designs prepared on request" and your choice of engines of either a V-8, V-12 or a V-16. Full color 9 1/2" x 13 1/2" ad that explains how Cadillac used their peacetime technology to develop engines and Hydra-Matic Transmissions for tanks. The text gives somewhat of a history mentioning that the M-5 Light Tank was developed first followed by the M-8 Howitzer Motor Carriage. Thousands of these machines were produced and are still in use in battlefields around the world. From the experience gained developing the previous tanks the M-24, which is pictured in the ad, was produced and is doing well in battle. These tanks are each using two of the Cadillac V-type engines driving two Cadillac Hydra-Matic transmissions. 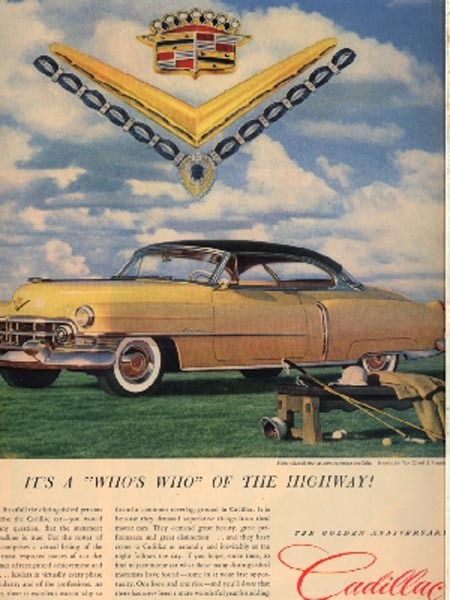 The text indicates that the wartime engines have been vastly improved over the peacetime engines which means that the post-war Cadillacs should be more dependable. Cadillac - Full color 10" x 13" ad that considers the rarity that is Cadillac's unique standing among the world's motor cars. There is a picture of a Green Cadillac Four-Door with a white top, shown with the white sidewall tires that were available at extra cost, from the side under the famous Alexander II Emerald Necklace, taken from the vaults of Cartier, arranged "in a position to resemble the renowned Cadillac 'V'". The text talks about it's half-century of building "as fine a motor car as it is practical to produce". It mentions, in a tantalizing manner, about the "wholly new, V-type. eight-cylinder engine" and urges you to come and inspect this new Cadillac. Cadillac - Full color 10" x 13 1/2" ad to celebrate Fifty Years of Cadillac. There is a drawing of a Blue Two-Door Cadillac parked on a gravel field with a cloudy but bright sky in the background and the headline says "New Goal for Twenty Million Motorists!". The text explains that research indicates that twenty million motorists would like to own a Cadillac, if they could afford it. It explains that, pictured here is their heart's desire, the Golden Anniversary Cadillac. It continues by talking about all of the beauty, luxury and performance people that drive this car will experience. Cadillac - Full color 9" x 12 1/2" ad that reminds you that driving your new Cadillac will probably be the "Highlight of the Day's Activities!". We see a lady dressed in light colors with a matching hat stepping out of her house and pausing to look at the Creme-Colored Four-Door Cadillac that waits for her to enter and be whisked away. The text mentions a couple of normal yet menial trips that could be on the agenda but claims that they will become special journeys when driving a new Cadillac. It describes the gleam and the fabric that one sees when they first look at this car and the wonderful experience you will have when driving under any kind of conditions in your new 1952 Cadillac. Cadillac Convertible - Full color 9 1/2" x 14" ad with a picture of a White Convertible with the top down. This ad talks about "a full half century of progress" and has the headline "Climaxing Fifty Years of Progress!" This ad is larger than my scanner bed so the outer edges of the ad will not be visible in the scanned view. Cadillac - Full color 10" x 13" ad has two photos of a White four-door Cadillac. The top, larger photo shows this classic car parked outside of what looks like a hotel as people look at the car. The other, smaller photo shows a front view of this car being driven toward the camera. The ad headline describes this car as "Worth it's price in Prestige". This ad is larger than my scanner bed so the outer edges of the ad will not be visible in the scanned view. Cadillac Convertible - Full color 9 1/2" x 13" ad has an overhead view of a Light-Colored Cadillac Convertible parked with the top down on a red driveway. Walking toward this car is a couple in white formalwear and the ad headline says "Where Pride is a Dividend!". This ad is larger than my scanner bed so the outer edges of the ad will not be visible in the scanned view. Cadillac - Full color 9 1/2" x 13 1/2" ad has a drawing of a Red Four-Door Cadillac parked against a white background. This car is placed under a photo of a well-dressed couple, looking like the King and Queen of Some Place Island and the ad headline asks the question, "You could Guess what car they came in!". The ad answers the question by saying "Of course, you'd guess they came in a Cadillac. And the chances are that you'd be right. Because it has long been an accepted truth that a vast majority of the outstanding people at outstanding events arrive...in Cadillacs. The winning of this priceless approbation has been a long, slow process for Cadillac It has taken fifty-two years of strict adherence to the highest ideals in design and manufacture - to convince the American people that Cadillac is the ultimate in motor cars". Cadillac - Full color 9 3/4" x 13" ad has a drawing a well-dressed couple being helped from their white two-door Cadillac by a red-suited doorman. The ad headline calls them "'Guests of Honor' wherever they go!". This ad is larger than my scanner bed so the outer edges of the ad will not be visible in the scanned view. Cadillac - Full color 6 1/4" x 9 1/2" ad has a drawing of a Red Two-Door shown against a white background under a picture of a formal affair with one young couple in the foreground. The ad headline states that "Maybe This Will Be The Year!" and claims they have made the decision to get more information on Cadillac. Cadillac - Full color 6 1/2" x 9 3/4" ad with a photo of a very serious looking group of men sitting around a board room table. The ad headline calls this a "Meeting of...Cadillac Owners!" and is over a photo of a Black Four-Door Cadillac. Cadillac - Full color 9 3/4" x 13 1/2" ad with a drawing of a blue four-door under a drawing of a couple sitting on the brick steps of a patio at a formal party. The ad headline claims that this car is "For the Sheer Joy of Living!". This ad is larger than my scanner bed so the outer edges of the ad will not be visible in the scanned view. Cadillac - Full color 10" x 13 1/2" ad that gives the impression that if you go to a Formal occassion you have to drive a Cadillac. The headline claims that it is the "Favorite of All Nations!" and shows a foreign dignitary, medals on his tux and a perfectly trimmed mustache, kissing the hand of a blonde in a strapless dress while diamonds dangle from her ears and from a necklace around her neck. Visible in the background are other foreign dignitaries mingling in the room that is filled with paintings on the wall and ornate chandeliers dimly lit. At the bottom of the page is a side-view picture of a Red Cadillac Four-Door that would be appropriate for bringing people such as this to an event like this. The text talks about this car being the car of choice of most Americans as well as people throughout the workd. Cadillac - Full color 6 1/4" x 9 1/2" ad with a drawing of a Red Cadillac Two-Door with a light colored top. There is also a family photo of a mother and her four young children over the headline calling them the "World's Best Reason for Ordering a Cadillac!" Cadillac - Full color 10" x 13 1/2" ad has a drawing of a vivid Yellow Four-Door. The ad also has a large photo taken at Christian Dior's Paris Salon of a group of people sitting and admiring a model showing a very ornate evening gown. The ad headline, referring to both the gown and the Cadillac, calls this "Styling the Whole World Admires!". The text talks about the comfort and quality this car has and talks about how the best way to realize how good this car is would be to come in and take it for a drive. They ask you to "come in today for a close personal inspection"
Cadillac - Full color 10" x 13 1/2" ad that suggests paying a little more this Christmas for your wife's present and getting her a new Cadillac. The top drawing of the two in the ad shows a happy lady who has just opened a small box from the man of her dreams and holds up a set of car keys. The caption calls it "The Christmas They'll Never Forget! Cadillac" and at the bottom of the ad is a Red Cadillac parked on a lightly snow-covered driveway in front of the columns of a white house. Cadillac - Full color 10" x 13" ad like many of the ones during this time that implied that if you owned one, you must have Class. There are two drawings of a Yellow four-door Cadillac and the top drawing is a broadside view of this car parked outside the Hotel Mark Hopkins waiting for a formally attired couple to come out. The bottom drawing is a front view of this same scene. The female patrons in the second drawing all seem to be carrying furs or wearing them and the test mentions that any gathering at the finer places will be attended by a surprising number of Cadillacs. Cadillac - Full color 6 1/2" x 9 3/4" ad with several photos of a Blue Two-Door and an Off-White Convertible parked in front of a large, colonial building for a nighttime gathering. Cadillac Convertible - Full color 6 1/2" x 9 3/4" ad has several photos of a Green Convertible with the top down. The top photo is from the side and the bottom photo is from the front with a formal affair letting out and people are coming out and getting into this and other Cadillacs. Cadillac Convertible - Full color 6 1/2" x 10" ad for the difference owning a Cadillac will make in your life. The ad has a picture of a Red Cadillac Convertible with the top down that is getting set to leave The Surf Club. While the couple that are driving it pause, several other people stand talking and checking this red beauty out. The ad assures you that "It gives a man a new outlook...when he first views the world through the windshield of his own Cadillac car". 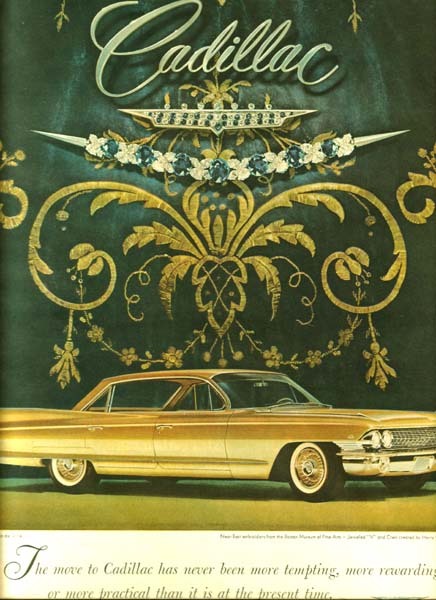 Cadillac - Full color 6 1/2" x 9 3/4" ad has a photo of a Green Four-Door with a White top shown against a gold background. The opinion that is given for this car is that it is "Magnificent Beyond All Expectations!" Cadillac - Full color 9 3/4" x 13" ad has a drawing of a majestic Red four-door parked against a reddish background. The ad headline calls this car the "Finest Expression of Motordom's Highest Ideal!". This ad is larger than my scanner bed so the outer edges of the ad will not be visible in the scanned view. Cadillac - Full color 9 1/2" x 13 1/2" ad that tries to have you believe that owning a Cadillac is the easiest way to attain status. There is a picture of the front of The Homestead where a formal event is letting out. A Yellow Four-Door Cadillac is placed conveniently in the way and a man stands by the front of the passenger side, waving with style at a couple who seem to be impressed. The headline assures you that "A Man Needs No Introduction...to those about him when he sits at the wheel of a Cadillac". Most of the rest of the text is about the reputation that a Cadillac has and the reputation that an owner of a Cadillac is sure to assume. Near the end of the text it does urge you to "stop in soon - spend an hours in the driver's seat" although I am not sure if they expect you to be impressed at the style and ride or the impression that you are bound to make on your friends. Cadillac - Full color 6 1/4" x 9 3/4" ad has a photo of several Cadillacs unloading their formally dressed passengers under the canopy of The Beverly Hills. The ad headline tells us that "A Single Glance Tells the Story...". Cadillac - Full color 6 1/2" x 9 3/4" ad with a photo of a White Four-Door stopped outside of the Bellevue Stratford. There is a formally dressed couple sitting in the back seat and a man is helping his formally dressed date into the front seat while other groups of people in formal attire mingle on the sidewalk. The ad headline calls the event, and the car, "The Debut". Cadillac - Full color 10" x 13" ad that wants you to believe that the 1958 Cadillac is better than the previous models. There is a picture of a Turquoise Four-Door Cadillac parked under the awning of the Del Monte Lodge and a formally-dressed couple are strolling down the bricked stairway toward their car where a man in a chauffeur's uniform stands while holding a rear door open. The heaadline brags that "It outsteps its own great traditions!" and the text talks about this "car of cars" representing a glorious step beyond even Cadillac's own high standards of excellence.It mentions a variety of models including the all-new Eldorado Brougham. Cadillac Convertible - Full color 6 1/2" x 9 3/4" ad with a picture of a Red Convertible with the top down parked in front of a stylish building with columns and curved arches. There are several groups of well-dressed people milling around but only one couple are standing next to this beautiful car. The ad headline calls this car "A Crowning Achievement...from every standpoint!" Cadillac - Full color 6 1/4" x 9 1/2" ad has a photo of a Blue-Green Four-Door that is parked and waiting for a couple that are coming down the steps of the Del Monte Lodge. The ad headline claims of this car that "It outsteps it's own Great Traditions!" Cadillac - Full color 10" x 14" ad that wants us to be aware that the new Cadillac is the new measurement of greatness. There is a picture of several well-dressed people coming out of a formal occassion and they are standing at the top of some stairs while their Yellow 4-Door Cadillac is parked on the street waiting. Below this is a picture of this car, from stem to stern, with it's elongated hood and the tail fins that seem to extend some ten feetpast the back. Cadillac - Full color 6 1/4" x 9 3/4" ad for the car that says good things about it's owner. The ad has a picture of a Red Four-Door against a white background and another that shows the frond end of this car parked in front of The Broadmoor as two couples stand chatting by the door. The ad headline calls this car "Cadillac...universal symbol of achievement". Cadillac - Full color 10" x 14" ad that brings to our attention the fact that Cadillac is "First in the world's esteem!". The larger picture shows a drawing of several well-dressed people looking at a pair of Cadillac's, one White and the other Black. They are outside talking to the couple that has pulled up and they are all wearing top hats and long gowns. Under the bottom saying we can see the Black Four-Door Cadillac parked sideways. The text says that "In every part of the world where highways exist and quality is recognized, Cadillac has become the accepted symbol of automotive greatness. And certainly, this international affection for Cadillac has never been more soundly based - or more richly deserved - than it is at the present time". Cadillac - Full color 6 1/4" x 9 1/2" ad has several pictures of a Blue Two Door Cadillac out on the town. There is a side view of it against a white background and another that shows the front end of this car as several well-dressed couples are standing by the front entrance of The Waldorf-Astoria. The ad headline defines it as "Cadillac...world's best synonym for quality!". Cadillac Convertible - Full color 9 1/2" x 13 1/2" ad that discusses the Public Acclaim that is claimed to be coming the way of the 1960 Cadillac. There is a picture of a Green Cadillac Convertible with the top down that is parked in front of a garden with stone steps and walls and a formally dressed couple who stand idly talking. The headline offers "Unique acclaim - even for a Cadillac" and the text goes on to talk about what is being said. It claims that "no one could deny the brilliance of its new performance - smooth, quiet, silken and eager" and urges you to drive the 1960 Cadillac for yourself. Cadillac - Full color 10" x 14" a with a picture of a Blue Two-Door Cadillac parked at the bottom of a slight incline. Two well-dressed people are walking towards it, looking as if they have just come from a wedding. The text headline says that this is "The best of years to make it yours!. The text itself implies that 1960 is the best time, so far, to purchase a Cadillac. Cadillac Two-Door - Full color 9 3/4" x 13" ad that brings attention to the history of Craftsmanship that has brought Cadillac to the top of the heap in American luxury cars. The ad has a picture of a regal-looking Red Two-Door parked on a brick roadway in front of marble and stone pillars next to well manicured hedges. A couple in evening wear stands looking at the car and realize that this is "Where Craftsmanship is a Creed". The text tells us that the best way to learn about it would be to "inspect and drive a 1960 Cadillac". The harder you look, the longer you drive the more convinced you become. Cadillac - Full color 10" x 13 1/2" ad with the headline that "Maybe this could by your 'someday'". The picture has a Yellow Four-Door Cadillac parked in a terrace that has columns and statues all around. There are two people standing close to it and they are both well-dressed as if they were taking part in a special event. The surroundings seem to bring about the same thoughts. The text tells us that nearly everyone would like to own a Cadillac. They claim that "the initial cost represents a sounder investment than ever in terms of value-received". Huh. Cadillac Sixty-Two Coupe - Full color 10" x 13" ad shows a Blue-Green Two-Door Cadillac against an embroidered background. The few words at the bottom of the ad say simply that "A new Cadillac car is one of the few material possesions for which there is no acceptable substitute"
Cadillac Sixty-Two Convertible - Full color 9 3/4" x 13" ad that has a drawing of a Red Convertible with the top down setting on a red floor against a red tapestry background. The ad text explains that "The Cadillac car is so soundly designed and so carefully crafted that it's very name has become a synonym for quality." Cadillac Fleetwood 60 Special - Full color 9 3/4" x 13" ad has a drawing of a Dark-blue four-door Cadillac setting on a white floor against a white tapestry background. It is "French embroidery from the Boston Museum of Fine Arts" and it is a Jeweled "V" and Crest created by Black, Starr and Gorham. The ad text explains that "Cadillac designers, engineers and craftsmen have only one objective: to continue to create the finest car in the world". 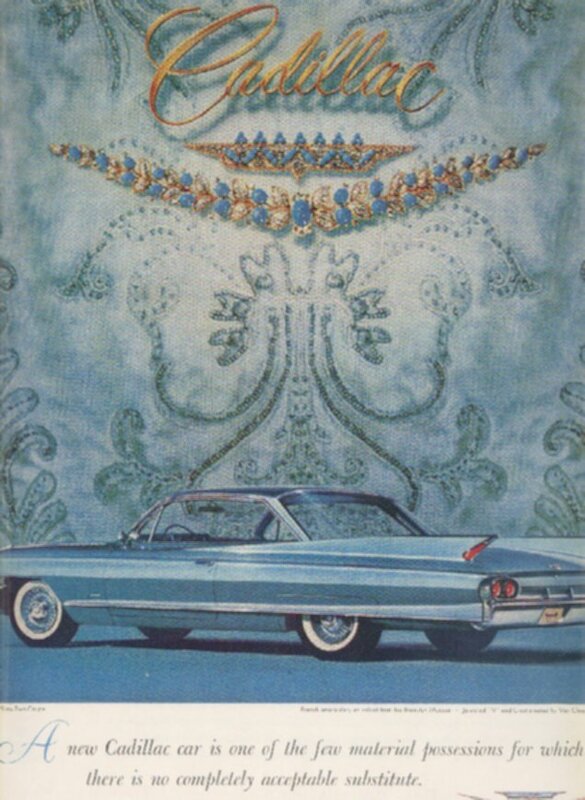 Cadillac Sedan de Ville - Full color 9 3/4" x 13" ad that has a photo of a White Four-Door Sedan de Ville standing proudly against a background of Turkish embroidery with the word Cadillac standing out near the top. This is "Turkish embroiodery from the Boston Museum of Fine Arts"" with the "Jeweled "V" and Crest created by Cartier". The ad tells us that "The new Cadillac is so practical to own and so economical to operate that it is acknowledged motordom's wisest investment." Cadillac - Full color 6 1/2" x 9 3/4" ad that gives the simple message behind Cadillac. 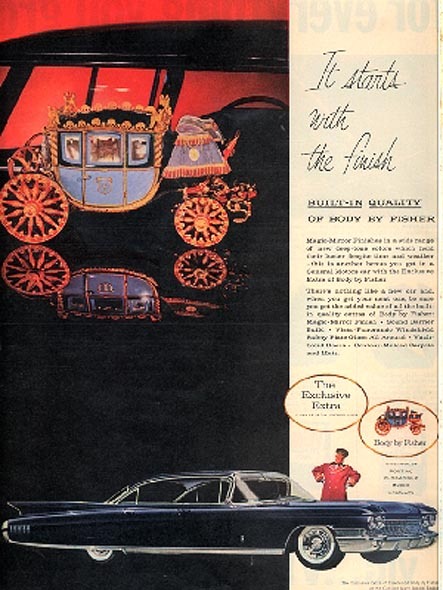 The ad has a picture of a Metallic Blue Four-Door Cadillac shown from the side with an embroidered and jeweled background and the message "Cadillac designers, engineers and craftsmen have only one objective: to continue to create the finest car in the world". Cadillac Sedan de Ville - Full color 10" x 13" ad with a photo of a gold four-door with a background of Near East embroidery. The wisdom imparted from this ad is "The move to Cadillac has never been more tempting, more rewarding or more practical than it is at the present time". Cadillac Coupe de Ville - Full color 10" x 14" ad that is mostly taken up by the background of the Green Two-Door Coupe De Ville and the words Cadillac over a picture of their decal. The text in this ad simply says that "Fourteen hundred seperate inspections assure that every Cadillac car is the most carefully built, precision-crafted autombile on the world's highways"
Cadillac Coupe de Ville - Full color 9 1/2" x 12 1/2" ad for the reliability of this elegant automobile. 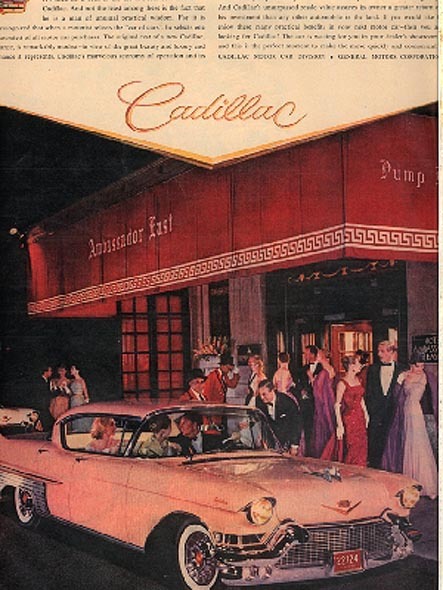 The ad has a picture of a Pink Coupe de Ville parked near a doorway where a couple in formalwear are passing through. The ad headline brings attention to "Cadillac dependability" and the ad claims that "it approaches the absolute in dependability". This ad is larger than my scanner bed so the outer edges of the ad will not be visible in the scanned view. Cadillac Four-Door Sedan de Ville - Full color 10" x 14" ad with a drawing of a Cadillac parked outside of the front door of an opulent, ornate building. An extremely well-dressed couple is standing at the front door, looking out at the car, a car that may be theirs or is one that they hope to be theirs. The headline of this ad is Cadillac luxury and the words following it are "A journey in a new Cadillac car is, without question, the most luxurious way in the world to reach any destination"
Cadillac Sedan de Ville - Full color 9 1/2" x 12 1/2" ad that showcases the amazing number of options that Cadillac offeres. The ad has a picture of a Red Sedan de Ville that is being admired by a couple who are standing by an open set of wrought iron gates. 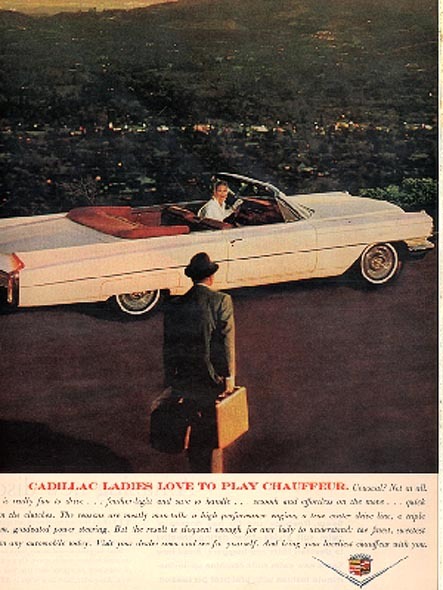 The ad headline mentions "Cadillac individuality" and the ad text claims that "The Cadillac is offered in such an abundance of choices that it would take ten years of continuous production to create every possible Cadillac combination". This ad is larger than my scanner bed so the outer edges of the ad will not be visible in the scanned view. Cadillac Sedan de Ville - Full color 7 3/4" x 11" ad that is the same as the previous one in a smaller size. Cadillac - Full color 9 3/4" x 12 1/2" ad that describes how driving up in a new Cadillac will put you on a higher tier with yor friends and acquaintances. There is a photo of a Cream-colored Four-Door parked on a circle driveway as the occupants, dressed in formalwear, walk cooly with heads held high toward the event. The ad headline says that "When you first drive up in a Cadillac,..." and the text claims that your initial entrance in a 1963 Cadillac will be the one that makes the most difference. You are warned that the engine is so quiet that you will have to learn to announce your arrival "with a tap of the horn". You are also made aware of the fact that everyone will want to inspect your new Cadillac. Cadillacs - Full color 6 1/2" x 9 1/2" ad that talks about "When Chauffeurs Talk Of Cadillacs". The scene is at night and three chauffeurs are killing time waiting for their riders to come out of whatever they have gone into. They are all dressed up in their uniforms, some light, some dark, and they have gathered by the tail end of one man's Cadillac discussing, well, they want us to believe that they are talking about their Cadillacs. The ad talks about how these men have formed a special fondness for these cars. The 1963 Cadillac seems to have everything that you would want. In fact, they feel that you will want to take the car out yourself. The heck with those chauffeurs. Cadillac - Full color 10" x 13 1/2" ad with a photo that shows the front-end from the height of the grille of the new Cadillac. The ad headline warns you to "Take your first look at the Nineteen Sixty-Three Standard of the World!" This ad is larger than my scanner bed so the outer edges of the ad will not be visible in the scanned view. Cadillacs - Full color 9 1/2" x 13 1/2" ad that illustrates "A Dozen Reasons for Cadillac's Greatest Year". The twelve different Cadillacs are shown in the ad with identification along the bottom of the ad. The text presents the dilema of "who could help but fall in love with all of them" and mentions they come with 143 interior selections, 106 exterior color combinations and a host of personal options. They claim to be "welcoming more new Cadillac owners than any previous year" and wonder, "Which Cadillac shall we start building for you?". Cadillac - Full color 6 1/2" x 9 3/4" ad has a photo of a Gold Four-Door with several people standing behind the car while a Black Four-Door 1961 Cadillac is parked on a roadway that is overlooking the newer car. The ad headline describes this scene as being "A new Cadillac and it's closest rival." Cadillac Fleetwood - Full color 9 1/2" x 13" ad that wants to convince you that there is nothing like a Cadillac. The ad has a picture of a Gold Four-Door Fleetwood that is parked on a roadway a little bit lower than a Black 1961 Four-Door Cadillac. The man who was driving the older Cadillac has come down and is talking to the man who owns the newer Cadillac while his wife sits in the passenger seat comfortably waiting. The ad headline identifies these two vehicles as "A new Cadillac and its closest rival". This ad is the same as another ad on this page but of a larger size. It is larger than my scanner bed so the outer edges of the ad will not be visible in the scanned view. Cadillac - Full color 9 3/4" x 12 1/2" ad claiming that the love affair with a Cadillac begins "When you first take the wheel of a 1964 Cadillac". Pictured is a White Cadillac parked on an area paved with bricks as a well-dressed couple stand looking at it admiringly. The text talks about this car having "the most extraordinary motoring advancements in a decade" and that has an engine that is "the most powerful in Cadillac history." It mentions some of the improvements that Cadillac has included and claims "more than one hundred ways new for 1964." 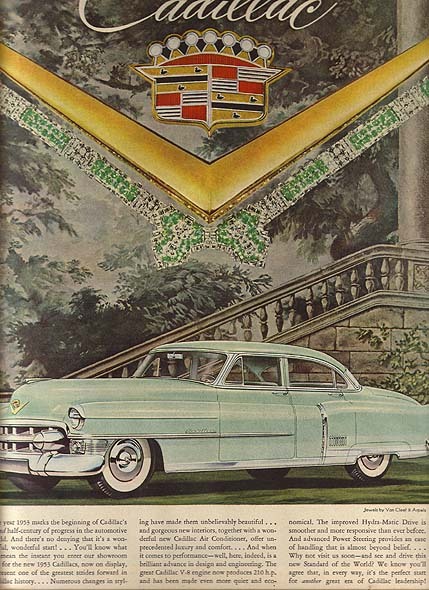 Cadillac - Full color 6 1/4" x 9 1/2" ad has a photo of a White Two-Door parked on a tree-covered drive that is covered with an ornate design of paver bricks. The ad headline begins that "When you first take the wheel of a 1964 Cadillac..." and goes on to describe features of this car. This ad is a smaller version of a previous ad. Cadillac - Full color 9 1/2" x 13 1/2" ad that talks about another way that passengers in a Cadillac are more comfortable than other people on the road. The picture looks like it has been taken from the back seat of one Cadillac. We see the dashboard and the lady driving her Cadillac and we see through her windshield at a Green Four-Door Cadillac that is being driven by another couple. The headline claims that "It's Easy to be a Weatherman in a new Cadillac" and the text goes into some detail about the Comfort Control system installed in this year's Cadillacs. Cadillac - Full color 7 3/4" x 10 3/4" ad with a photo of a White Four-Door Cadillac parked on a gravel driveway under a row of full grown trees. A little girl, in her sunday best, is swinging on a swing tied to a branch barely visible while her parents stand watching her and their Cadillac. The ad headline claims that "Cadillac's ride almost too smoothly for little girls". Cadillac - Full color 9 1/2" x 13 1/2" ad that does something that most Cadillac owners don't have to do, discuss the engine. The picture is of an early morning with the mist rising off of the field or river that comprises the background as a Turquoise Four-Door Cadillac strongly makes its way along the blacktopped road. The headline asserts that "Cadillac owners seldom give their engine a thought" and the text reasons "Why should they? It's so quiet they can barely hear it." We are reminded that the people at Cadillac give it a great deal of thought and the 1964 Cadillac engine is the most powerful in Cadillac history. It is matched up with an improved Hydra-Matic transmission or, in some cases, a remarkable new Turbo Hydra-Matic". For these reasons and many others, this year's model is "more tempting than ever!" Cadillac - Full color 6 1/2" x 9 3/4" ad has a photo of a Gray Two-Door being driven on a rainy green tinted city street. The ad headline begins the description of this cars features by saying "If you have never driven a 1964 Cadillac..."
Cadillac - Full color 6 1/2" x 10" ad for what they claim is "More than a New Car...a New Cadillac". There is a picture of a Turquoise Two-Door Cadillac parked in front of a large brick building with a colonial door where the man who has just driven up in this car pauses and takes another puff from his pipe as he looks proudly back at it. The text discusses how it has been completely redisigned so that it now proudly and truely holds the title of The Standard of the World!. Cadillac - Full color 9 1/4" x 12 1/2" ad with a photo of a Copper colored Four-Door Cadillac parked on a wet evening in front of a stylish building. The chauffeur is standing by the passenger side door looking in at the car's plush interior as he waits for his passengers to return. The ad headline tells us that "There's a New Celebrity in Town!" and the text says that this car is just beginning to be seen everywhere. It also mentions some of the features and that Cadillac came in eleven models this year. Cadillac - Full color 9 1/2" x 13 1/2" ad that calls our attention to the Smooth Ride that a Cadillac gives and wonders if it is too smooth. The ad has a picture of a green lawn with a tree in full bloom and a White Cadillac Sedan De Ville parked under it. A little girl in a red coat is swinging on a long roped swing as her parents carefully watch and the headline says that "Cadillacs ride almost too smoothly for little girls". The text reminds us that Little Girls like activity and the floating feel of riding in a Cadillac will drive those little girls crazy. Big girls, like mothers, like nothing better than being transported on the cloud-like ride that a Cadillac will supply. They even enjoy taking the wheel because these cars are "tailor-made for feminine direction". The model year 1965 offered eleven new models, "one perfect for you and your family". You are urged to drive one then find out how easily it can be afforded. 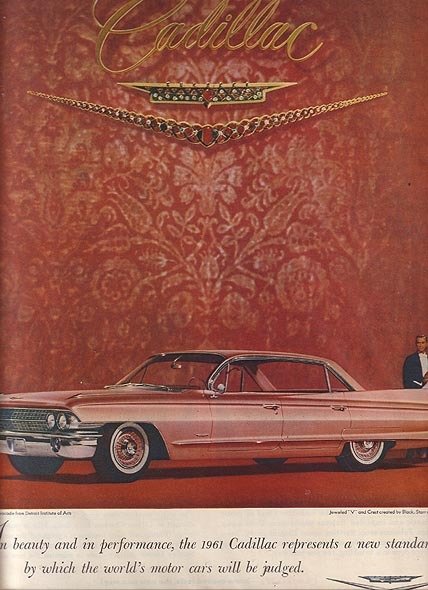 Cadillac - Full color 6 1/2" x 9 3/4" ad with yet another reason to consider buying a new Cadillac. The ad has a picture with two Cadillacs parked at different levels by a European-style building. At the street-level is a 1965 Creme-colored Cadillac Four-Door with two men standing and talking by the passenger side front fender. Just above this car, on a slightly higher level, is a maroon 1963 Cadillac Sedan de Ville looking just as good as new while three men stand by it's passenger front fender. The ad headline reminds us that "Greatness never goes out of style" and that "a Cadillac, regardless of age, is still a Cadillac". Cadillac - Full color 9 1/2" x 12" ad has a photo of a parking lot where a Blue-Green 1965 Sedan de Ville, Light Yellow 1964 De Ville Convertible and a Light Blue 1962 Coupe de Ville are parked and surrounded by attentive people. The ad headline says "Go Ahead...Go Cadillac" and the ad gives reasons why you should buy either a new or previously-owned Cadillac. The text says that "Naturally, if your choice were unrestricted you would prefer one of Cadillac's eleven exciting models for 1965". Then, speaking to the rest of us, it reasons that the "Next best choice would be a late-model, previously-owned Cadillac". Cadillac - Full color 6 1/4" x 9 1/2" ad that has a photo of a White Four-Door that is carrying four people in comfort along a road that overlooks a scenic lake. The ad calls this car "The most beautiful investment on the highway!" Cadillacs - Full color 6 1/2" x 9 3/4" ad for the new edition of Cadillacs. 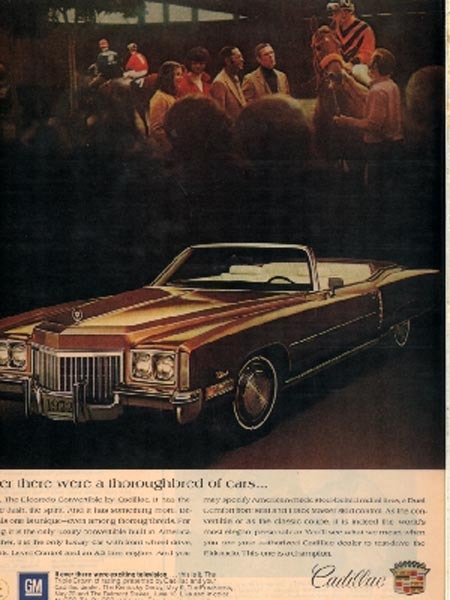 The ad has a picture of a White De Ville Convertible with the top down and a picture of a Dark-Blue Four-Door Fleetwood Brougham parked with the driver's side door open. 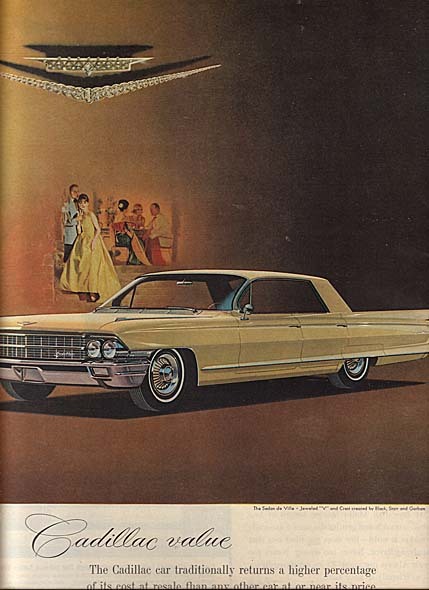 The ad headline starts with "Presenting the nineteen sixty-six Cadillac" and gives an excited description of what you can look forward to in these breathtaking automobiles. Cadillacs - Full color 6 1/4" x 9 1/2" ad with a picture of a formal evening in front of a building with arches and columns. Well dressed people are getting out of a double line of cars that, just happen to be, all Cadillacs. The ad headline states the obvious, "Some nights you'd think everybody drives Cadillacs. Cadillac Hardtop Sedan de Ville and De Ville convertible - Full color 10" x 13" ad shows both of these vehicles driving on a hilly country road. The picture shows a Gold Hardtop Sedan de Ville going from left to right at the bottom of the hill as it ferries three passengers in total comfort. At the same time a White de Ville convertible with the top down starts up the hill with it's two passengers. The headline reminds us that "It's Great...Going Cadillac" and continues on by trying to describe the amazing driving experience that is offered by the 1966 Cadillacs. Cadillacs - Full color 6 1/2" x 10" ad that has a photo of a Grey Two-Door Cadillac and a photo of a Dark Blue Eldorado. The ad headline states "For 1967...Surprisingly New! Superbly Cadillac! and introducing Eldorado World's Finest Personal Car." 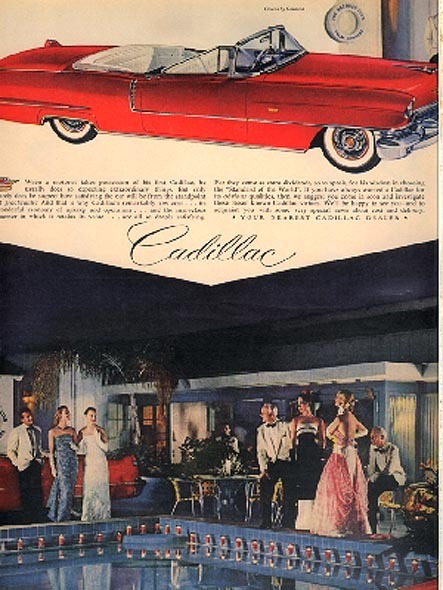 Cadillac - Full color 6 1/2" x 9 3/4" ad has a photo of a White Two-door parked in the driveway of a two-story stone house that has a couple coming down the front steps. The ad headline describes this car as "Already - The most acclaimed Cadillac of all time." Cadillac - Full color 6 1/4" x 9 1/2" ad with a photo of a gold Two-Door parked on a curving driveway in front of a brick house. In the photo a younger man is standing with the driver side door open as he talks to an older man standing with his hands in his pockets. The ad headline warns you that "Once you drive it, you won't want to give it back". Cadillac - Full color 10" x 12 1/2" ad shows an exterior view of a Sedan de Ville and an interior view of a Fleetwood Brougham. 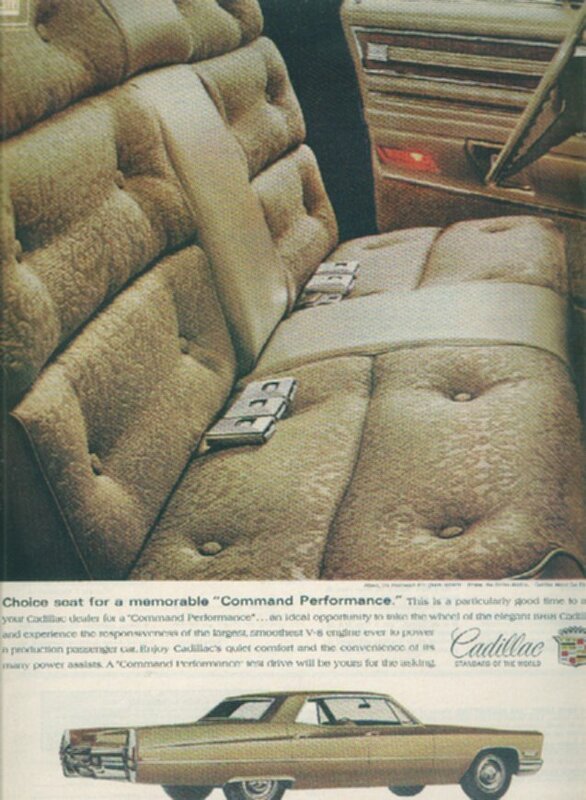 The ad headline describes it as a "Choice seat for a memorable 'Command Performance'". Cadillac Fleetwood Eldorado - Full color 9 1/2" x 12 1/2" ad with a picture of a Gold Colored Eldorado with a white top. The ad has a larger picture of a man in a dark suit sitting in a dark Cadillac looking with a smile on his face at this new Eldorado. The ad headline assures us that "Only one car can make a Cadillac owner look twice". This ad is larger than my scanner bed so the outer edges of the ad will not be visible in the scanned view. Cadillac Fleetwood Brougham - Full color 6 1/4" x 9 1/2" ad with a picture of a majestic White Four-Door shown against a very dark green background. Above is a small photo of a formally dressed couple in an outside setting. The ad lets you know that "The brilliant 1969 Cadillac may not be your first, but it will certainly be your finest"
Coupe deVille - Full color 9 1/2" x 13" ad with a picture of a Gold Coupe deVille with a black top shown against a red background with the image of an older man painting a picture of a young girl. The headline urges you, "Don't let another year go by" and the text wants you to admit that you have wanted a Cadillac for years. It mentions the many reasons why you, and many others, would want a Cadillac and reasons that, now is the time. The catchphrase in the ad is "Do it today...not someday"
Cadillac Eldorado - Full color 9 1/2" x 12 1/2" ad has a photo of a Gold Two-Door against a red background. The ad headline calls this "The newly spirited 8.2 litre Eldorado". This ad is larger than my scanner bed so the outer edges of the ad will not be visible in the scanned view. Cadillac - Full color 9 1/2" x 12 1/2" ad has a photo of a Blue Two-Door against a blue background and under a dreamy vision of an upscale couple shopping in an antique shop. The ad headline claims that "The more you seek out excellence, the more you belong in a Cadillac". This ad is larger than my scanner bed so the outer edges of the ad will not be visible in the scanned view. Cadillacs - Full color 6 1/4" x 9 1/2" ad has a photo of the the entrance to a rustic area. On the dirt parking lot is parked a Red Coupe De Ville and a Gold Four-Door Seville. The ad headline calls them "Two kinds of luxury. One great name." Cadillac Cimarron - Full color 9 1/2" x 12" ad with photos of a Brown Four-Door Cimarron. There is a photo of this car being driven toward the camera and a photo of the dashboard taken from the driver's point-of-view. This ad is larger than my scanner bed so the outer edges of the ad will not be visible in the scanned view. Cadillac Fleetwood - Full color 7 3/4" x 10 3/4" ad for "The most advanced Cadillac ever...". The next quotes were "The technology might surprise you. The luxury shouldn't". There is a picture at the top of the page of a Four-Door Cadillac Fleetwood parked and waiting for passengers. The ad says it all when it says "The sculptured aerodynamic styling and responsive power are at once contemporary and Cadillac". They marvel at the "only transverse-mounted front-wheel-drive V8 in a production car". You will be comforted by the fact that your Cadillac was built to last and it will be backed by a 4-year / 50,000 mile limited warranty. Cadillacs - Full color 73-page Dealer Brochure for all of the models available this year. The brochure covers each model with pictures and specifications as well as text on their Engines and their Anti-Lock Braking Systems.